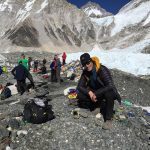 Stuart has reached Everest Base Camp and he even managed to make some measurements on the CdTe solar cell which we look forward to analysing on his return next week. This entry was posted in Latest News on March 14, 2019 by Emma Dawson. Stuart is at 3880m and has made the first measurement of our solar cell. 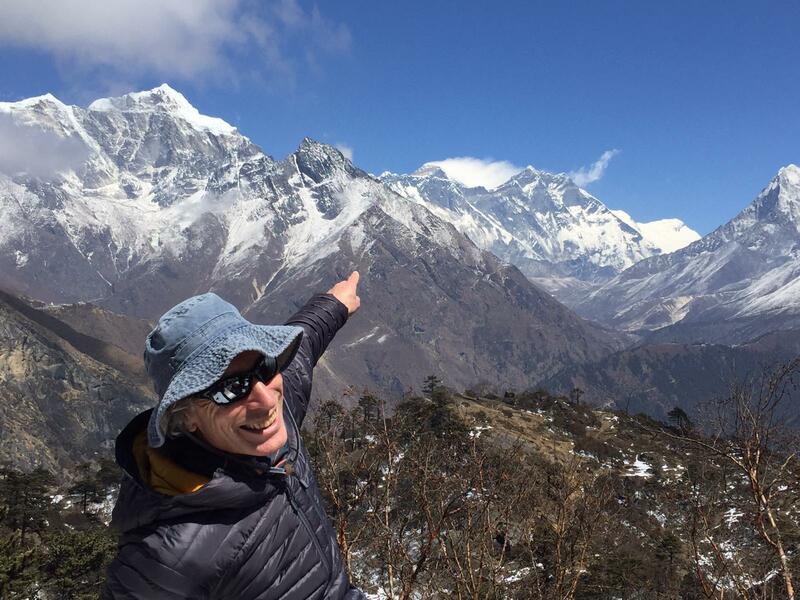 He has sent us a picture, here you can see him pointing at Everest. This entry was posted in Latest News on March 6, 2019 by Emma Dawson. Researchers from CSER will be attending the next PVSAT-15 conference to be held in University of Warwick on the 10th-12th April 2019. On the first day, Dr. Giray Kartopu will deliver a talk on ‘All laser processed CdTe monolithic mini-modules deposited by MOCVD’. On day two, Dr. Andrew Clayton will be talking about ‘Development of chemical vapour deposition fabrication of perovskites for photovoltaics’. On the last day, Ralph Hall will be telling us about his research into ‘Near-IR Transparent Back Contact for CdTe Thin Film Photovoltaics’. ‘Developing an effective activation process for ZnTe:As back contact for CdTe solar cells’ Ochai Oklobia, Giray Kartopu, and Stuart J.C. Irvine. This entry was posted in Latest News on March 4, 2019 by Emma Dawson. 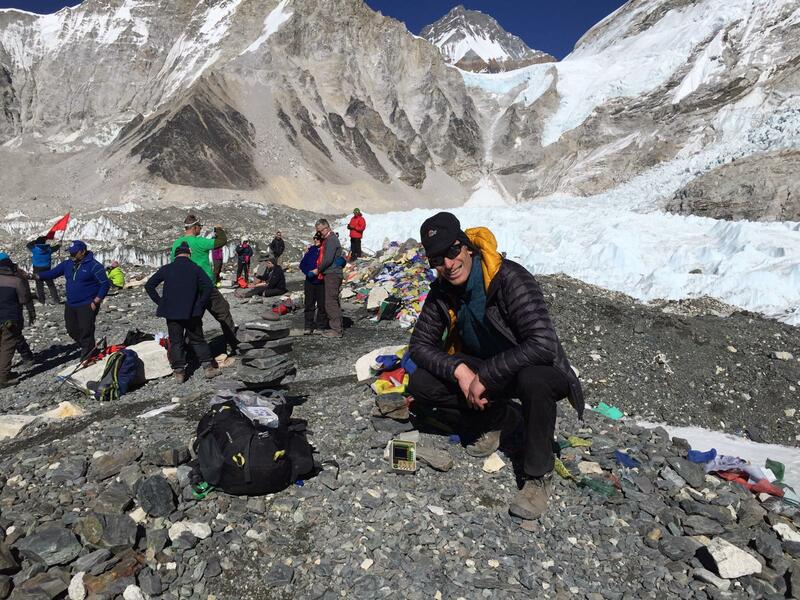 Professor Stuart Irvine will make the trek to Everest Base Camp at the beginning of March 2019 as part of a Brick Children School charity awareness and fundraising expedition. Not content with a 17 day round trek reaching an altitude of 5150 metres, Stuart will also be conducting some SPARC II experimental research. He’ll be measuring one of the Centre for Solar Energy Research groups thin-film cadmium telluride solar cells on ultrathin glass with the electronics and software provided by the University of Surrey. This data will complement that of the CubeSat mission https://www.youtube.com/watch?v=_5AFwxnNxAU currently orbiting the earth with an analogous solar cell on board. This February, Dr Giray Kartopu has started his new British Council Newton Fund project: Solar Energy Enabled Electricity Generation via High-Performance CZT/Si Tandem Cells. This project is in collaboration with Middle East Technical University, Turkey and will help to revolutionize the PV industry in Turkey by developing a new high efficiency, low-cost tandem photovoltaic (PV) solar cell structure. Professor Irvine will present at the 35th European Photovoltaic conference in Brussels 24th- 28th September. Giving a talk entitled “In-Line MOCVD of Al doped ZnS: A Path to High Performance CdTe Solar Cells”. This entry was posted in Latest News on September 20, 2018 by Emma Dawson. This entry was posted in Latest News on July 12, 2018 by Emma Dawson. This entry was posted in Latest News on February 2, 2018 by Emma Dawson. The SPARC II research team’s from Swansea, Bangor and Aberystwyth Universities will attend a project meeting 25th Jan, 2018 at the Swansea Bay Campus. Dr Andy Clayton has been selected to make an oral presentation at the MRS conference in Boston, November. His talk will be presented in symposium ES03 and will cover his research in the MOCVD of Tin Sulphide (SnS) for use as a photovoltaic absorber layer. This entry was posted in Latest News on November 8, 2017 by Emma Dawson. An upcoming IOM3 EMG Annual Lecture is taking place on the evening of the 13th July. This lecture will be given by Dame Sue Ion DBE, FRS, FREng – Chair of the Nuclear Innovation Research Advisory Board (NIRAB). This entry was posted in Latest News on May 24, 2017 by Emma Dawson. This weeks BBC Science Cafe sees Adam Walton exploring the latest technology to harvest the power of the sun, including the search for more sustainable materials to be used in the manufacture of solar cells. This entry was posted in Latest News on April 19, 2017 by Emma Dawson. CSER was well presented at this years PVSAT-13 which took place in Bangor during the 5th – 7th April 2017. The conference gave the SPARC II team an excellent opportunity to disseminate results from the SPARC II Project to a wider audience where the latest advances in UK research and development are presented and discussed. Dr. Dan Lamb also gave an oral presentation discussing the ‘First flight test of a Thin Film Cadmium Telluride (CdTe) Solar cell on cover glass in space’. On the final day, Dr. Giray Kartopu presented his findings on ‘Development of ZnO/CdS/CdTe core-shell nanorod-based solar cells with an extremely thin absorber’. If you wish to know more about our current research, please contact us via our contacts page. This entry was posted in Latest News on April 12, 2017 by Emma Dawson. We are pleased to report that the funding (£5m) for SPARC II (Solar Photovoltaic Academic Research Consortium) has been approved by the Welsh European Funding Office (WEFO) and provides underpinning funding for a collaboration of 6 research teams across the Universities of Swansea, Aberystwyth and Bangor. Please see below the links for the official WEFO SPARC II project funding announcement along with the Swansea University announcement. This entry was posted in Latest News on March 17, 2017 by Emma Dawson. 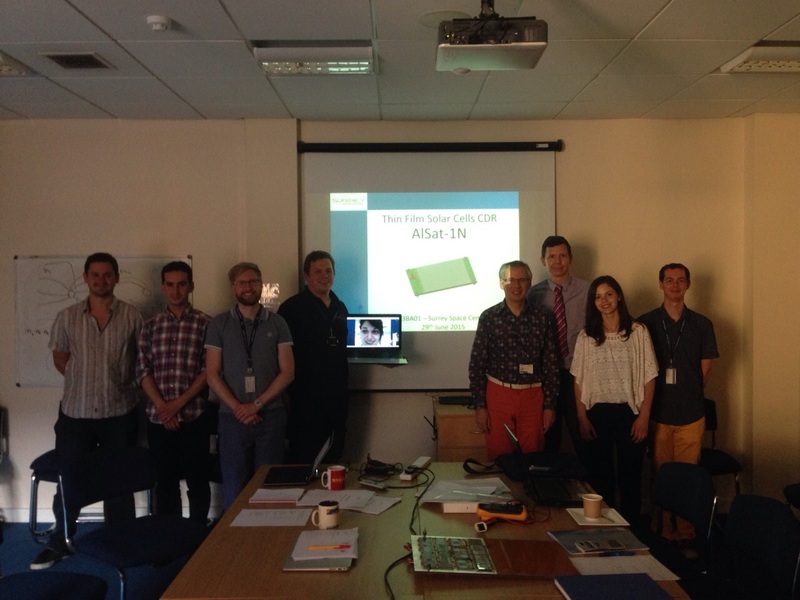 Please find link below for the latest BBC news article on the AlSat nano satellite mission! This entry was posted in Latest News on January 3, 2017 by Emma Dawson. This entry was posted in Latest News on December 14, 2016 by Emma Dawson. Dan will present a talk entitled “Lightweight Solar Cells for Space and UAV’s Applications” at the Advanced Engineering 2016 expo, November 3rd at the Birmingham NEC. This entry was posted in Latest News on October 28, 2016 by Emma Dawson. CSER solar cell successfully launched into space! This is the first solar cell deposited directly onto cover glass to be deployed in space! See our Space Solar Cells section for more details. This entry was posted in Latest News on September 27, 2016 by Emma Dawson. Dr. Dan Lamb is presenting at this years British Science Festival which is taking place at Swansea University during the 6th – 9th September. Dan’s talk will take place on Friday 9th September at 12:00-13:00 in lecture theatre K in the Faraday Building. Intro: On Earth, solar power is a promising renewable energy source but solar cells were originally developed to power the satellites orbiting our planet. Now, initiatives such as Space Based Solar Power and Lunar and Martian Bases are driving the need for a new type of solar cell. Join Dan Lamb to find out about his work developing ultra-lightweight solar cells that are being tested in the UK Space Agency’s CubeSat mission this summer. This entry was posted in Latest News on September 5, 2016 by Emma Dawson. The Centre for Solar Energy Research (CSER) has recently joined the College of Engineering in Swansea University. CSER will still be based at the OpTIC Centre on the St Asaph Business Park. This entry was posted in Latest News on May 20, 2016 by Emma Dawson. CSER made an excellent representation at this years premier UK photovoltaics conference PVSAT-12 which took place between April 6th and April 8th at the University of Liverpool. This entry was posted in Latest News on February 11, 2016 by Emma Dawson. Professor Stuart Irvine featured in a recent Materials World magazine article (3 Sep 2015), commenting on the carbon-positive home developed under the Smart Operation for a Low Carbon Energy Region (SOLCER) project. This was a LCRI funded project that CSER participated in and that investigated ‘smart operation’ of energy supply, storage and demand systems in Wales. This entry was posted in Latest News on October 2, 2015 by Emma Dawson. Professor Stuart Irvine and Dr Andrew Clayton attended the 2015 E-MRS Fall Meeting and Exhibit held in Warsaw University of Technology. Stuart gave a very well received invited talk entitled “Ultra-thin glass: the ideal superstrate for thin film PV”. The main theme of Stuart’s talk was that reducing cost of PV can be achieved through: improved module efficiency, manufacturing volume, yield and materials reduction. This is an area that the team at CSER are busy researching. Dr Dan Lamb will represent CSER at the UK Space Conference July 14th. Held every two years, the UK Space Conference is the unmissable gathering for the entire UK space community; bringing together the space industry, users of space-based services, entrepreneurs, academia and government. CSER will be in attendance as part of the Wales country stand (B32, D29, D30) the Arena & Convention Centre, Liverpool. This entry was posted in Latest News on July 13, 2015 by Emma Dawson. Professor Stuart Irvine is the Symposium organiser for Symposium E1.1 “Materials for Energy” of EUROMAT 2015, Warsaw, Poland 20-24 September 2015. He will attend the EUROMAT conference which has been held every two years since 1989, and which have an increased record of bringing together up to 2000 researchers, scientists, trainees, and students from both academia and industry to discuss critical developments and perspectives in the field of materials science and technology and their applications. This entry was posted in Latest News on July 9, 2015 by Emma Dawson. Professor Stuart Irvine will attend the E-MRS Fall Conference in Warsaw, Poland 15-18 September 2015, invited talk entitled: “Ultra-thin glass: the ideal superstrate for thin film PV?”. The E-MRS Fall Meeting draws an audience from around 50 countries each year. Representing quality and quantity, this audience comprises key decision-makers involved in the field of materials research. Dr Dan Lamb will attend the UK Space Conference, July 13-15th, Arena & convention centre Liverpool. Held every two years, the UK Space Conference is the unmissable gathering for the entire UK space community; bringing together the space industry, users of space-based services, entrepreneurs, academia and government. CSER will present a poster based on the Thin Film Solar Cell payload currently being developed for the UK Space Agency’s next satellite mission. CSER’s work will be presented alongside other Wales Academic Space Partnership (WASP) work. The Centre for Solar Energy Research (CSER) is making excellent progress towards delivery of its Thin Film Solar Cell demonstrator to the UK Space Agency. CSER’s Dr Dan Lamb attended a critical design review meeting at the Surrey Space Centre where some of the finer details of the Thin Film Solar Cell payload where worked through. The UK Space Agency’s Satellite programme is committed to a tight time schedule with delivery of CSER’s payload to the CubeSat manufactures by September 2015 and launch to take place spring 2016. Once the Thin Film Solar Cell is in orbit its performance will be systematically measured and the data beamed down to mission control at the Surrey Space Centre. The CubeSat is expected to generate data for at least one year which will be invaluable for producing high quality publications, securing further funding for the research and promoting Glyndŵr University’s contribution to space science. Dr Dan Lamb (3rd from right) representing Glyndŵr University along with members of the satellite build team from the Surrey Space Centre. Professor Stuart Irvine and Dr Vincent Barrioz will represent CSER at the 2015 European MOVPE conference workshop in Lund, Sweden, June 07-10th . The workshop will consist of eight invited plenary talks and contributed poster presentations. All aspects of MOVPE are of relevance, with a special emphasis on the science of MOVPE. Dr Barrioz will give an invited talk entitled “A route to inline MOCVD of flexible, high specific power CdTe solar cells”. This entry was posted in Latest News on June 9, 2015 by Emma Dawson. The KTN, the Engineering and Science Group North Wales, OpTIC Glyndŵr University and the Welsh Opto-electronics Forum will show in this event how light is used in engineering applications as well as showcase innovations in Wales where light is used in manufacturing. Delegates are invited from industry academic and professional institutions as well as the graduates, students and the general public. There will be a display area for pull ups, tabletops, demonstrations, please contact susan.sheridan@wof.org.uk if you would like to book a place. CSER’s Dr Dan Lamb will present a talk on “Space Application Thin Film Solar Arrays” at 2.pm. This event is free of charge however pre-booking is essential on: https://www.eventbrite.co.uk/e/bright-lights-and-engineering-tickets-16560767702. This entry was posted in Latest News on May 16, 2015 by Emma Dawson. CSER will make an excellent representation at this years premier UK photovoltaics conference PVSAT-11 April 15-17 th. Professor Stuart Irvine will deliver a talk “The potential for further reduction in the embodied carbon in PV solar energy systems”. Dr Andy Clayton will talk on “A new approach to SnS thin film PV using MOCVD” and Dr Giray Kartopu will speak on “Comparative study of conventional vs. one-step-interconnected (OSI) monolithic CdTe modules”. Dr Dan Lamb will present a poster “Preparation of a Thin Film CdTe Solar Cell for Flight Testing on a Satellite”. This entry was posted in Latest News on April 14, 2015 by Emma Dawson. The Centre for Solar Energy Research (CSER) has been selected to take part in the UK Space Agency’s next CubeSat mission. The AlSat Nano is a joint space mission between the UK Space Agency and Algerian Space Agency (ASAL). CSER’s successful selection, following a presentation to the UK Space Agency in Swindon by Dr Dan Lamb (project leader), offers a fantastic opportunity to “flight test” their innovative Thin Film Solar Cell. The programme is committed to a tight time schedule with delivery of CSER’s payload to the CubeSat manufactures by September 2015 and launch to take place spring 2016. Once the Thin Film Solar Cell is in orbit its performance will be systematically measured and the data beamed down to mission control at the Surrey Space Centre. The CubeSat is expected to generate data for at least one year which will be invaluable for producing high quality publications, securing further funding for the research and promoting Glyndŵr University’s contribution to space science. This entry was posted in Latest News on March 13, 2015 by Emma Dawson. 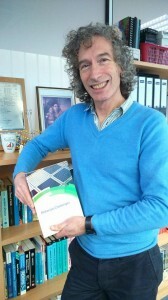 Professor Stuart Irvine, CSER has edited a new book, “Materials Challenges: Inorganic Photovoltaic Solar Energy” published by the Royal Society of Chemistry. The idea for the book came from the Photovoltaic (PV) SUPERGEN project which was a collaboration of UK Universities to carry out ground breaking research in thin films for PV solar energy. PV SUPERGEN was a £10m funded project which was led by Professor Irvine from 2004 to 2012. It was felt that a book would provide a legacy to capture some of the exciting research and new developments, providing a stimulus for future research. Many of the chapters have been authored by members of the PV SUPERGEN team and also contributors from CSER, Dr Vincent Barrioz and Dr Andrew Clayton. International contributions came from the world leading National Renewable Energy Laboratory in the USA and from Universidad Politecnica de Valencia in Spain. 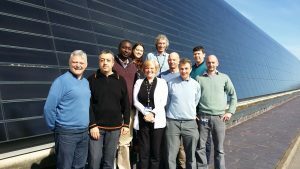 “This has been a rewarding experience and provides an authoritative work on the many research challenges in thin film PV that is very much at the core of research in CSER at Glyndwr University” said Professor Irvine. This entry was posted in Latest News on January 13, 2015 by Emma Dawson. This entry was posted in Latest News on November 6, 2014 by Emma Dawson. This is a unique opportunity to disseminate UK R&D excellence to a broad industrial audience in a themed poster presentation session with a drinks reception on the evening of the 15 October at this premier UK solar industry event. One page abstracts are invited on the broad themes listed below for selection for poster presentation at the UK R&D Showcase. The best poster in each category will be awarded at the drinks reception and will have the opportunity to write an article on the R&D project that will feature in PV International. Abstracts must be 1 side of A4, submitted as a pdf file to Emma Dawson ( e.dawson@glyndwr.ac.uk) and must include the following: abstract, title, authors, affiliation, email address of lead author and poster category. The body of the abstract should explain to a broad audience the novelty and achievements of the research and the potential impact on future solar energy products and deployment. This entry was posted in Latest News on October 16, 2014 by loquela. Dr Vincent Barrioz, Senior Research Lecturer in CSER presented a keynote invited talk at the 17th International Conference on Metal- Organic Vapour Phase Epitaxy in Lausanne, Switzerland last week. The title of the presentation was “MOCVD for solar cells, a transition towards a chamberless inline process” and described some ground breaking work on a new process for high volume manufacture of semiconductor thin films which has been carried out on the SPARC and the CIPAM project. This was very well received by the international audience and Vincent received many very positive comments following the talk. This entry was posted in Latest News on October 18, 2014 by loquela. LCRI’s Welsh Energy Sector Training project has developed a series of training courses based on recent research from the LCRI, covering the themes of Hydrogen, Large Scale Power Generation, Low Carbon Built Environment, Marine Energy, Solar PV, Enterprise and Economy. The WEST Conference will offer a range of taster sessions, and the opportunity to register for more in-depth training. Speakers at the conference will include Professor Peter Pearson, Director of Low Carbon Research Institute, Dr Julie Gwilliam, Director of Welsh Energy Sector Training, and David Clubb, Director of RenewableUK Cymru. The training courses are aimed at people working, or interested In working with the energy sector in Wales. They are available via a blended learning format, either purely online, or as a mixture of online and face-to-face sessions, and are fully funded for people living and working within Convergence areas of Wales. The Centre for Solar Energy Research has been awarded a new Welsh Government A4B funded project “Chamberless In-line Processes for Advanced Materials (CIPAM)” which is worth £207,155. This is a 15 month project, led by Dr Vincent Barrioz. This project started on the 1st October 2013 and will take forward the pioneering work on the unique in-line MOCVD process for deposition of thin film solar cells. This project will enhance the portfolio of IP owned by Glyndŵr University on the processing of functional materials and will help to attract inward investment to North Wales. The ESP KTN and The Centre for Solar Energy Research (CSER) and The Welsh Opto-electronics Forum are working together to explore the needs, drivers and future expectations of the PV Solar Energy industry within the UK to assist in producing a new UK PV Roadmap. On the 2nd and 3rd May 2013 CSER hosted a workshop to explore the needs, drivers and future expectations of the PV Solar Energy industry. The event and conference dinner was attended by over 30 key industrial and academic delegates working across the supply chain in PV with the Keynote presentation being delivered by Ray Noble of the Solar Trade Association. The roadmap will inform funding bodies and government agencies of areas requiring vital funding. It will be an important tool in enabling a vision for the sector, including the supply chain in it entirety, whilst also addressing key issues such as incentives, training, public awareness and education. The presentations from the event can be found by clikcing the links below. 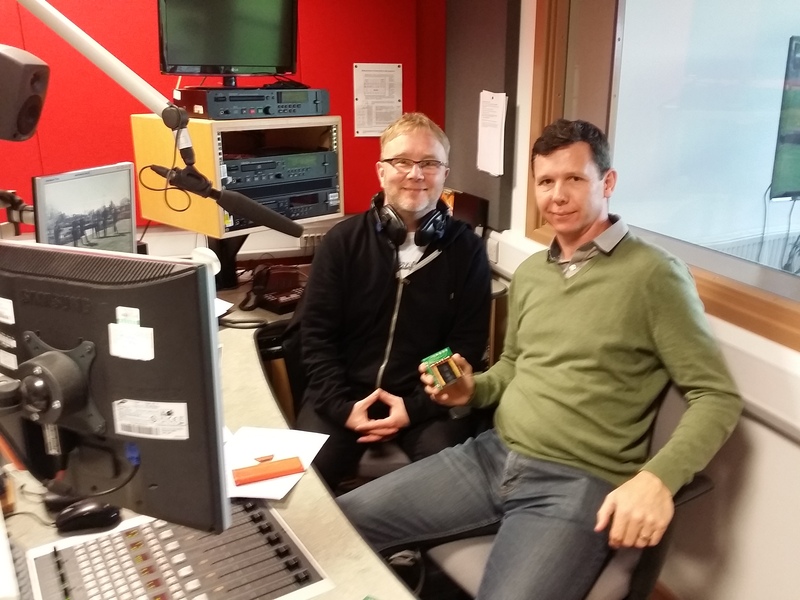 Nigel Mason, PV Consulting Ltd.
Richard Molloy, Eaton Electrical Ltd. If anyone has an interest in completing the survey or has any business contacts that they feel would be able to participate in the survey to help CSER create the roadmap please follow the link below.